Can I create a content series that recurs regularly? Utilizing content themes and recurring content topics are an effective tactic in publishing and content marketing. 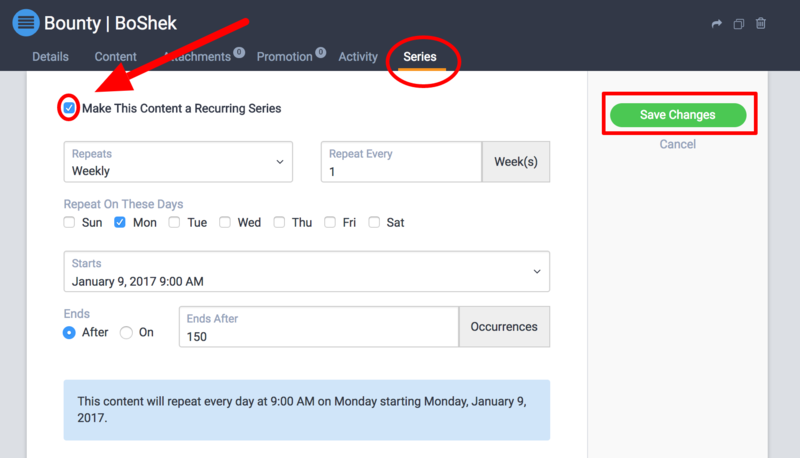 DivvyHQ's Recurring Series feature makes it easy to set these up and save time. Create a new content item or open an existing content item. From the Sandbox interface, click the Series Tab. Enable the recurrence settings by checking the 'Make This Content a Recurring Series' box. Adjust the settings to achieve your desired recurrence. Upon saving, Divvy will create duplicates of the original content item and allow you to edit each instance individually. For more details regarding this feature refer to our deep-dive article.